A warning by a senior Republican senator that "bold decisions" will be required on Iraq if progress is not made soon has prompted talk that the White House might be forced into policy changes after the mid-term elections in November. But some change is in the political air in Washington. The former US Secretary of State James Baker, who co-chairs the Iraq Study Group has said on ABC News: "I think it's fair to say our commission believes that there are alternatives between the stated alternatives, the ones that are out there in the political debate, of 'stay the course' and 'cut and run.'" Mr Baker's commission is due to report after the mid-term elections. It could be the peg on which a shift of approach is hung. The co-chair Democrat Lee Hamilton has been critical of the Iraqi government's performance. 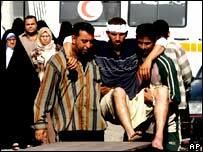 "The Iraqi government must act," said Mr Hamilton in September. Update: The Los Angeles Times reported on 16 October that the panel recently discussed two options. The first is called "Stability First". It would aim to stabilise Baghdad primarily while trying to get insurgents into politics. Iran and Syria would be asked to help in some way, though just how the US could bring in two of the countries it is most hostile to in the region is not at all clear. The second is "Redeploy and Contain" -- withdrawing US troops in stages, perhaps to bases outside Iraq from which they could operate anywhere in the region. These two options were first reported by the New York Sun which said that basically the Iraq Study Group was recommending in any case that the administration should drop the idea of forging a democracy in Iraq. Mr Baker himself simply talks of a "representative" government. The problem for President George W Bush was illustrated by an example only recently. 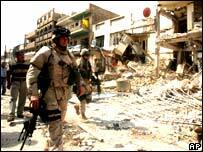 The hope that US troops would be "stood down" as Iraqi troops "stood up" was turned upside down. It was an Iraqi police unit in Baghdad that was stood down, because of suspicions that it was condoning militia murders. If the US cannot rely on the Iraqis, then the policy of transferring responsibility has no prospect of success. The president's options are limited. There are at least four wars going on Iraq - the war by jihadists against US troops, the war by nationalists against US troops, the war by Sunni jihadists against Shias and the war by Shia militias against Sunnis. Any action he takes to alleviate one area could impact on another. He is hardly likely to announce a withdrawal. He himself has said that Iraq is the frontline in the war on terror he declared after 9/11. Withdrawal therefore would be an admission of defeat in that war and might hand the country over to the jihadists, his absolutely worst nightmare. He could send more troops. But the US public might object and Congress might not pay. He could threaten to withdraw some troops in the hope of shocking the Iraqi government do more against the Shia militias. But that might simply not work. And it could encourage the insurgents. He could suggest negotiating with the nationalist insurgents. 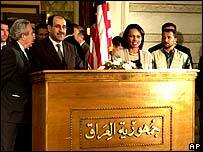 The Iraqi government is already trying to do so but will not accept the insurgents' demand for a US withdrawal. But can the violence be stopped without insurgent agreement? He could suggest dividing Iraq more clearly along its ethnic lines under a new federal structure. But that could precipitate a full-scale civil war, or at least increased communal violence. And is not the Iraqi government supposed to be sovereign? And would the majority in the parliament, which so far opposes such divisions, accept it? Yet this option is one that is being increasingly discussed in the US. Democratic Senator Joseph Biden, the senior Democrat ion the Senate Foreign Affairs Committee, has proposed dividing Iraq into three mainly autonomous regions with a weak central government. If the Democrats do well in the mid-term elections, Biden's voice will be strengthened. Marina Ottaway, Director of the Middle East programme at the Carnegie Endowment, says that Washington might be shaping up to encourage the departure of Prime Minister Maliki. "They might prefer a government of 'strongmen' who would oversee a greater division of the country in a looser federation," she said. Something more radical has been pressed for a long time by a former US diplomat Peter Galbraith, who is close to the Iraqi Kurds. As ambassador to Croatia he was involved in the break-up of the former Yugoslavia and sees parallels to Iraq which he says was "just cobbled together". His is a "three-state solution" however, which might go well beyond anything the Bush administration could suggest. Alternatively, Mr Bush could just batten down the hatches and stick it out. The senator who has challenged the administration is John Warner, chairman of the Senate Armed Services Committee. He said bluntly: "In two or three months if this thing hasn't come to fruition and if this level of violence is not under control and this government able to function, I think it's a responsibility of our government internally to determine is there a change of course we should take. "I wouldn't take off the table any option at this time." Senator Warner made similarly grave remarks this time last year when he suggested the plan to hand over to Iraqi forces as soon as possible. His assessment that it is his plan that is now failing gives his comments added impact. The White House was not prepared for these remarks. A press secretary Dana Perino admitted: "I don't know what Senator Warner meant by that." She referred reporters to a speech he made in Salt Lake City on 31 August. "He said 'this is a crucial moment'," said Ms Perino. "And he said that the American people 'are very patient, as long as the Iraqi government continues to make hard decisions and continues to make progress.'" So the US is giving the government of Iraqi Prime Minister Nouri Maliki some more time to try to pull things together. Mr Maliki has announced yet another plan for reconciliation, this time by setting up local security committees but nothing he has done so far seems to have matched the needs of the time and the country.